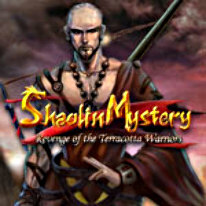 Save your people from an invading force in Shaolin Mystery: Revenge of the Terracotta Warriors! Travel dangerous mountain roads, visit Shaolin temples, free a mighty dragon, and save your village in this exciting hidden object game! Find useful items as you search exotic locations and explore ancient China. Will you work quickly enough to stop the Terracotta Warriors? Find out in Shaolin Mystery: Terracotta Warriors!